(Hamburg) The Hanseatic city tried long to resolve the conflict between downtown development, commercial development and road noise. With the housing industry was an “Alliance for Living” received. The urban sprawl of the outher regions should be avoided and existing green spaces in the city protected. Absolute priority is to focus on infill and brownfield sites. Downtown projects, however, are inviteable in the vicinity of roads, industrial parks and sports facilities. The design challange therefore is to avoid the noise and air pollutants. The evaluation of the strategic noise mapping revealed that road traffic is the main source oft the noise pollution. Small-scale activities were carried out: intersection modifications, whispering asphalt, speed reduction. A truck-driving ban is in principle possible, but would have to be connected to a truck management system. A reduction of speed to 30 km/h at night time is also included in the concept, but after calculation provides only 2-3 dB noise reduction. Seen in sum the above mentioned noise avoidance strategies are not enough and must be supplemented by project-related activities. The acoustic minimum requirement is in on a day outside level of 70 dB/A at night and 60 dB/A. To ensure a sound level of 30 dB/A in the interior of the apartment, to be placed on the development planning high standards. Also considered that the value should be reached within 0,5 meters measured from the tilted window. 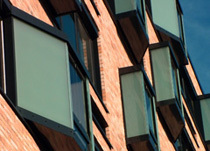 A survey of Federal Environment Agency 2011 showed that 80% of Germans consider the possibility of a tiltable window as essential to the quality of living. The Hamburg Ministry for Urban Development and Environment has developed the guide „noise in the urban land in 2010“. A key element ist the floor plan. Bedrooms und children´s rooms to be built on the side facing away from noise. Where is not consistently, the lounges are protected by a glazed balcony. Certain window constructions with a sound-absorbing cladding and soffit of the lintel and a limitation oft the tilt range have been developed. These so-called „pixel-window“ similar in function to the box-window. The outer window protrudes out from the building and is used as a design element oft he facade. This should be allowed to sleep with tilted windows. However, the noise reduction measures are hardly possible for family homes. The effecitve application requires at least four to six-storey apartment buildings. Ideally, a noise bar is located in front of the apartments. This requires low emission commercial areas, such as offices and practices. In order to achieve differentiated and intelligent noise protection measures an intensive monitoring of projects at all levels of the process is required: development plan process, urban and high structural contests, building permit process. This effort is necessary in order to promote a certain routine in dealing with increased sound insulation requirements for all parties involved. This entry was posted in noise and tagged downtown, noise-reduction on 2013/10/15 by joachim-w.